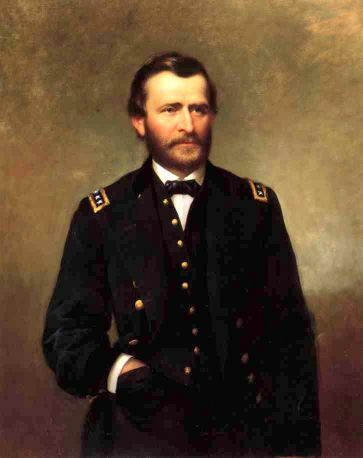 "The inauguration of Ulysses S. Grant in 1869 did more than usher into the Presidency an honored war hero," according to historian Poppy Cannon, it launched an era of opulence in the White House "the United States had not seen before and has seldom seen since." Culinarily speaking, however, Grant’s first few months in office could hardly be described as extravagant. When the 46-year-old military hero moved into the White House, he brought with him a quartermaster from his army days to serve as cook. To her credit, Grant’s wife Julia refrained from complaining at first, but when it became clear that the "chef" viewed the White House dining room as little more than “an enlarged mess hall,” she replaced him with an Italian steward named Valentino Melah, who had catered for some of the finest hotels in the United States and "specialized in opulent banquents." In the beginning of the feast, fruit, flowers, and sweetmeats grace the tables, while bread and butter only give a Spartan simplicity to the "first course," which is composed of a French vegetables oul, and according to the description by those who have tasted it, no soup, foreign or domestic, has ever been known to equal it. The ambrosial soup is followed by a French croquet of meat...The third "course" of the dinner is composed of a fillet of beef, flanked on each side by potatoes the size of a walnut, with plenty of mushrooms to keep them company. The next course is...made up entirely of luscious leg of partridges, and baptized by a French name entirely beyond my comprehension. Although President Grant enjoyed partaking in such opulent banquets, he retained a taste for more basic fare, no doubt shaped by his old soldier's days. One of his favorite breakfasts reportedly consisted of "broiled Spanish mackerel and steak, fried apples with bacon, buckwheat cakes, and a cup of strong black coffee." At lunch and dinner, he enjoyed such simple meals as roast beef with wheat bread and boiled hominy. And for dessert, historians tell us that "nothing ever pleased President Grant as much as simple rice pudding." In a medium-sized saucepan, bring the milk, rice and salt to a boil over high heat. Reduce heat to low and simmer until the rice is tender, about 20-25 minutes. Stir frequently to prevent the rice from sticking to the bottom of the pan. In a small mixing bowl, whisk together egg and brown sugar until well mixed. Add a half cup of the hot rice mixture to the egg mixture, a tablespoon at a time, vigorously whisking to incorporate. Add egg mixture back into the saucepan of rice and milk and stir, on low heat, for 10minutes or so, until thickened. Be careful not to have the mixture come to a boil at this point. Stir in the vanilla. Remove from heat and stir in the raisins and cinnamon. Serve warm or cold and enjoy!